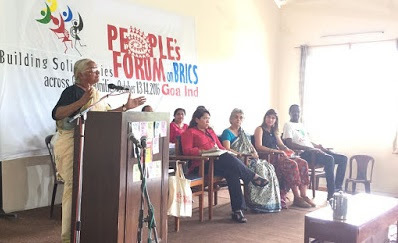 Speakers at the session recounted that BRICS was formed to challenge the “imperialistic and hegemonic nature of institutions such as the World Bank and International Monetary Fund (IMF)”, with the intention to “bring about social justice and equity in these countries that was home to over 50% of the world’s population”. “BRICS has done little to advance social justice and equity in these countries”, she said, adding, “India, despite being the largest democracy in the world, is also a sight where the poorest and the most marginalized people are continuing their struggle for social justice, dignity and identity. “People have been kept outside of the decisions that are taken on their behalf for their development”, she regretted. Pointing out that the new government that came through the coup has “already taken anti-people measures”, Maria read out the demand of the feminist movements in Brazil, and called upon the world’s institutions, including BRICS, to come up with a people’s agenda to defeat patriarchy and poverty. Trevor Ngwane, who led several workers’ struggles in South Africa and also an academic, recounted the extreme levels of inequality that exist in the South African society. He called for a pan-African unity and expressed his doubts over South Africa representing the voice of Africa all by itself. Dorothy Guerrero, while commenting on China, spoke about the urban-rural divide that exists in the country. She rued the steps taken by the Chinese authorities in curtailing migration from the rural to urban, while doing little to improve the country side. She spoke about the increasing corporate control over people’s resources – leading to massive protests by people in the countryside, led mostly by the peasants. Yet, the news of such resistances rarely make it to the global media. A large number of civil society representatives from Goa also made their presentations at the conference, including Sabina Martis, Caroline Collaso, Fr Maverick, Favita Dias and Thalmann Pereira. Most of them spoke about the massive loot of natural resources that is taking place in Goa. The Goan activists spoke about the negative impact of corporate led tourism on small businesses in Goa, and the ecological damages being inflicted because of this. The speakers also pointed out at the atrocities being committed on women, Dalits and Adivasis in the state, while attempting to appropriate resources.